Bishop John Martin Henni had long dreamed of establishing a seminary to train priests to serve German-speaking Catholic immigrants in his Milwaukee diocese. In 1853, architect Victor Schulte was commissioned to design a seminary building at the south inlet of Milwaukee Bay. Lay brothers and other laborers and craftsmen were housed on the grounds during the construction period. At least 5,000 persons attended the laying of the cornerstone July 18, 1855 and the first students arrived in 1856. They found that the building housed classrooms, a dormitory, a dining room, and a temporary chapel. Later, as enrollment at the seminary increased, wings were added to the main building in 1869 and 1871 and the temporary chapel was replaced by Christ King Chapel in 1861. A gold cross extended eleven feet above an octagonal cupola on the Italianate-style main building announcing its presence to travelers. When Archbishop Henni died in 1881, he was buried in a crypt in the chapel. It was not until the cemetery’s centennial, however, that his name was given to its original building. 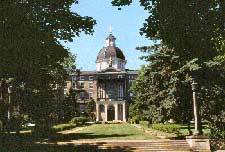 Saint Francis de Sales Seminary began its academic collaboration with Sacred Heart School of Theology in 2006. Today the seminary again focuses solely on priestly formation. The first Sisters of St. Francis arrived in Milwaukee in 1847 and established a convent south of Milwaukee. They cared for the orphans of St. Aemilianus Asylum and when St. Francis Seminary opened in 1856 on adjacent land, they became housekeepers for that facility. The Motherhouse was temporarily removed to Jefferson and then to La Crosse. It was returned to Milwaukee in 1878 and a new structure was dedicated in 1888. The Sisters then became active in Catholic elementary education and soon had charge of twenty parochial schools as well as the students at the orphanage and St. John’s School for the Deaf. Their first high school for girls, St. Mary’s Academy was dedicated in 1903. Additions to the Academy were made in 1922 and 1931. The Sisters of St. Francis also established Cardinal Stritch College, located in Fox Point.